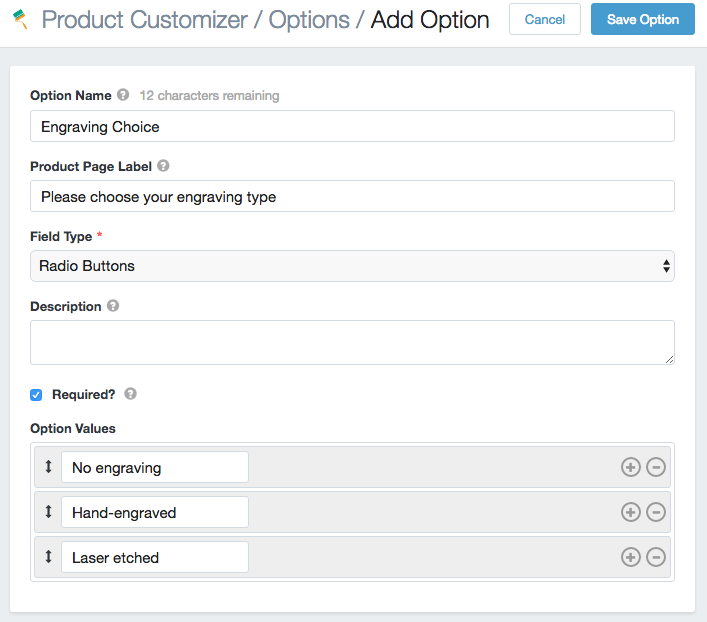 Product Customizer allows you to create several kinds of options for your products. A product can have as many options as you'd like; there are no limits to the number of options and choices you can create for your products. This article will cover general fields that help you create any kind of option, as well as some fields specific to certain option types. You can create a new option by going to the "Options" tab in Product Customizer and clicking the "Create Option" button in the top right. 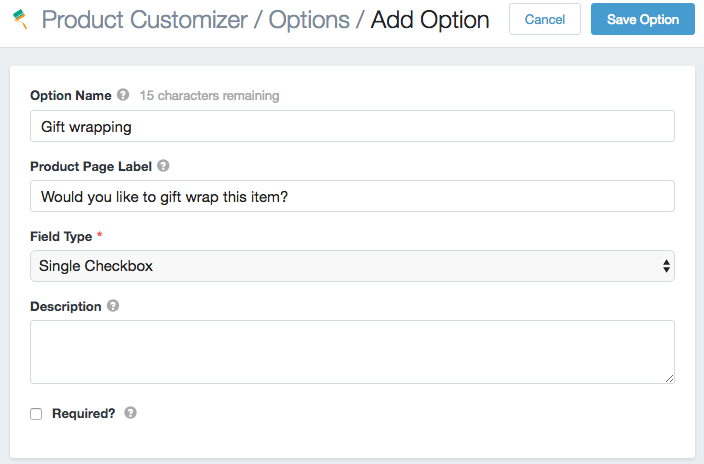 This will let you add a new "parent" option, which can then be added to one or more products easily. 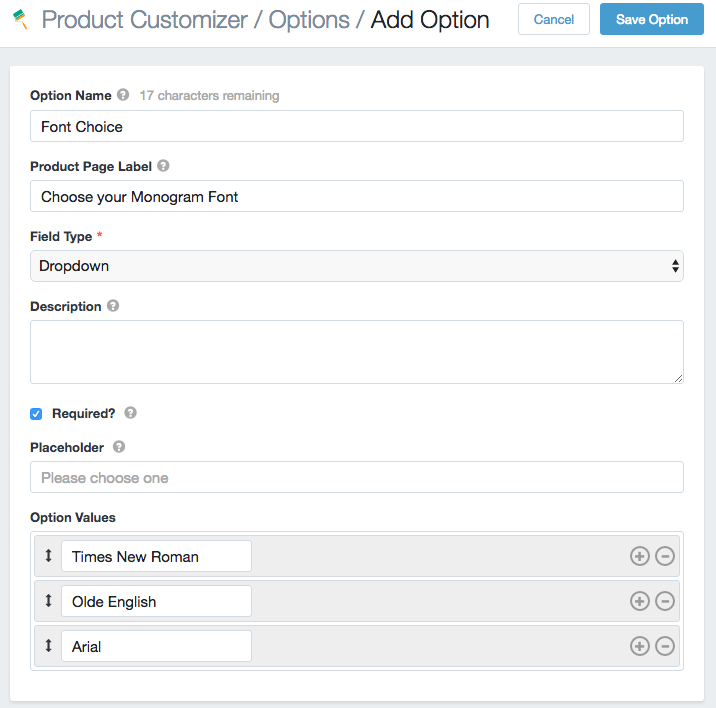 If you are customizing a product and you find that you need a new parent option, you can also "quick-create" an option from the "customize product" screen. This will create a parent option, then also apply the option to your product (the option this product will now be a child option). Option Name: (Required) The option's name for your reference. This is shown to the customer throughout your shop, such as on the cart page and in emails. 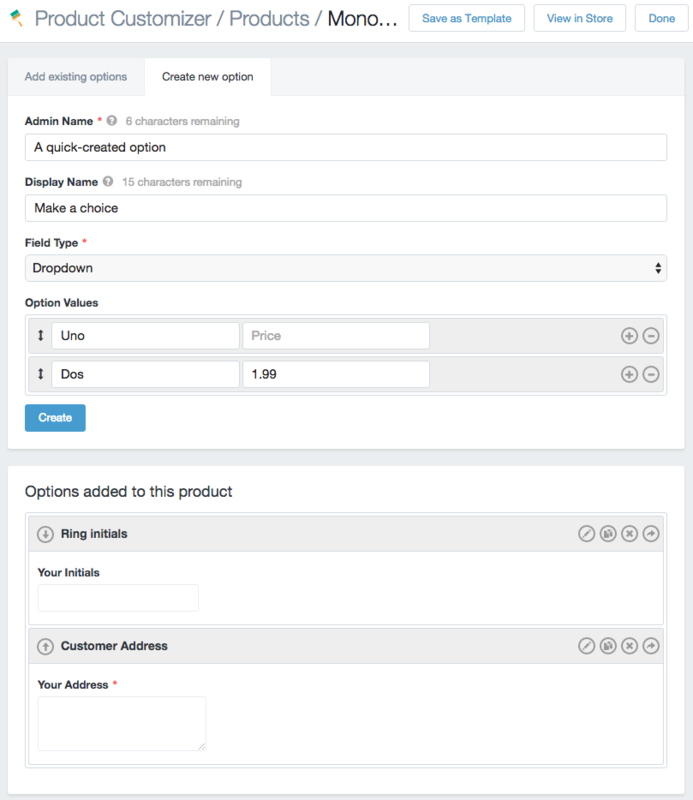 Product Page Label: (Optional) The option name displayed to customers on the product page. 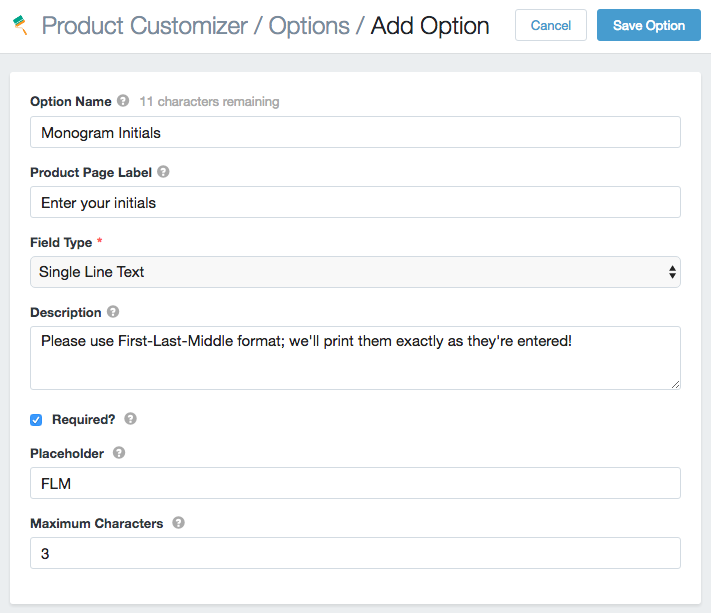 This is helpful for product pages specifically, as the option name is limited to 28 characters. For example, if you have an option named "File upload", you may want to make the product page label, "Upload your file -- 20MB maximum" to help customers complete this field. Description: (Optional) The description is shown on product pages only below the option name (or product page label if set). This can be a good way to show further instructions to a customer on completing the field. The description is not shown anywhere else in your shop. 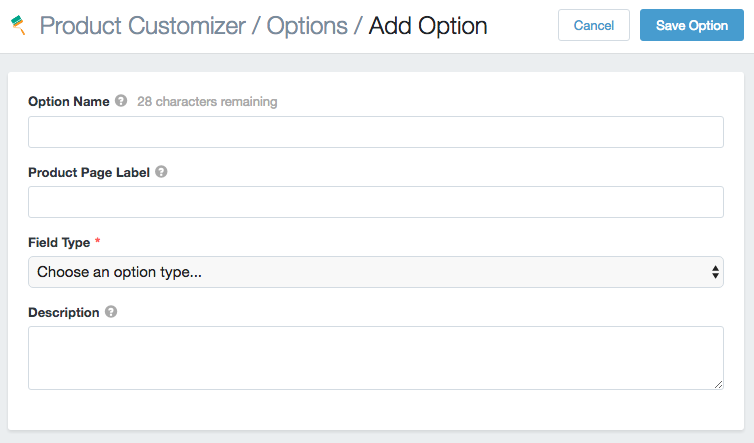 The regular tier of Product Customizer does not allow you to add costs to your options. In order to do so, you must use the premium tier of the app. If you are a Product Customizer Premium Tier User, please view the details in this document on creating options, then read about adding costs to options here. Required: (Optional) Check this if the customer must complete the field in order to add the product to the cart. If unchecked, the field is not mandatory for customers to purchase the product. 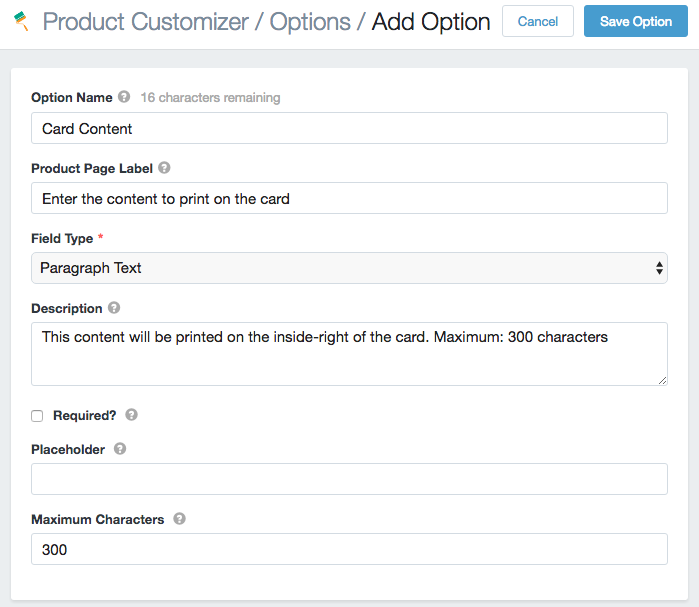 Maximum characters: (Optional) Sets a maximum on the number of characters (letters, numbers, spaces, etc) that can be entered into this field by the customer. The dropdown field allows you to create option values, which are the choices listed in the dropdown. Customers may choose only one choice from the list when purchasing the product. There are also a few additional options. Required: (Optional) Check this if the customer must make a selection in order to add the product to the cart. If unchecked, the field is not mandatory for customers to purchase the product. Checking "required" will force the use of a placeholder; a default one will be shown unless you enter placeholder text. Placeholder: (Optional) This is some text that will be shown as a placeholder element as the first choice in the dropdown. The customer cannot select this as a choice, and it will be forced if the dropdown is required. 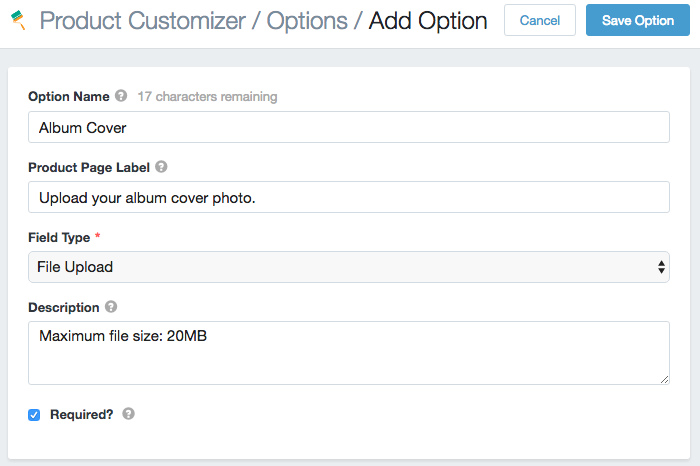 The file upload field allows customers to upload a file as part of the order. The file size limit (imposed by Shopify) is 20MB per file. The single checkbox allows customers to opt into one choice as a "yes / no" field. Required: (Optional) Check this if the customer must complete the field in order to add the product to the cart. If unchecked, the field is not mandatory for customers to purchase the product. In the case of a single checkbox, making this required means the customer must check the field (helpful for things like terms and conditions, but not for choice). Checkbox groups require you to create option values, which are the choices listed for each checkbox. Customers may choose multiple choices from the list when purchasing the product, depending on whether you set minimum / maximum values. 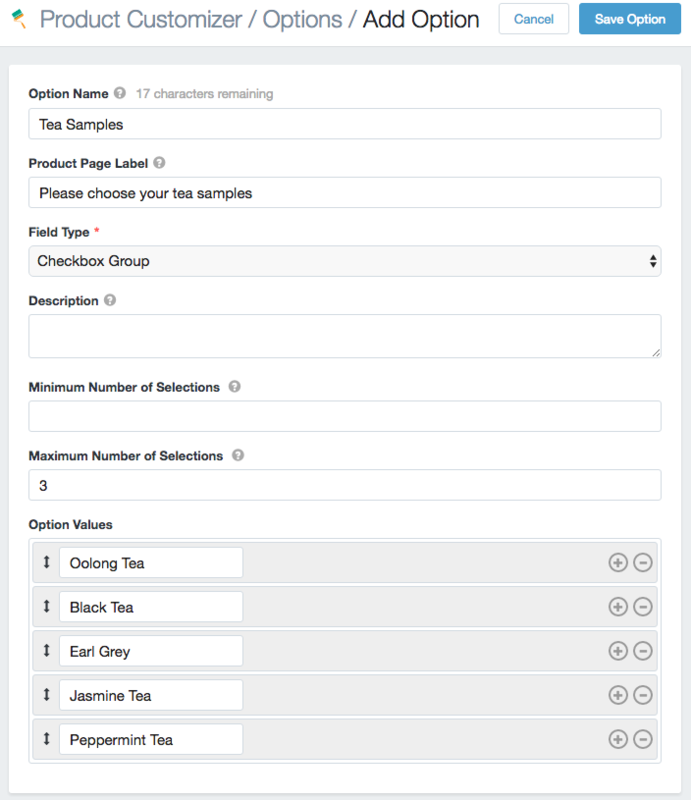 The customer will see minimum and maximum values below the checkbox group on the product page to inform them of the appropriate number of choices. Minimum Number of Selections: (Optional) You can enter a minimum number of selections for the group. The customer will not be able to add the item to the cart unless at least this many boxes are checked. Maximum Number of Selections: (Optional) You can enter a maximum number of selections for the group. Once the customer checks this number of choices, the rest of the checkbox inputs are disabled. The radio button field allows you to create option values, which are the choices listed for buttons. Customers may choose only one choice from the list when purchasing the product.